This Tree guides you in asserting your expectations so as to design better arrangements and work for another following severe demoralization. 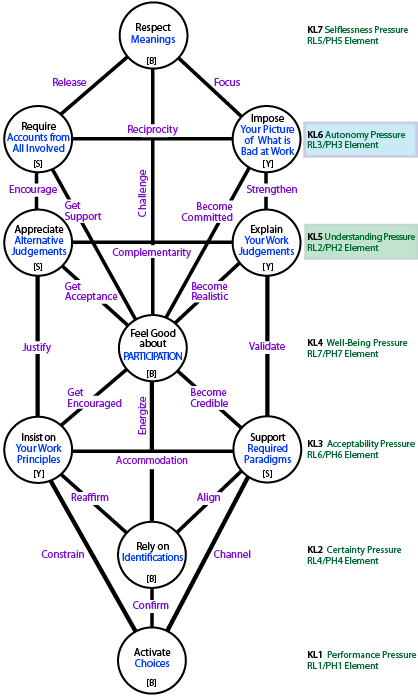 Note: The main Autonomy level in this emergent framework appears to be KL5: Judgements because when work goes awry, fault is focused on judgements, and better arrangements require understanding via judgements based on mutually acknowledged values. It may help to read this part first. Make It Happen is at KL1 by Activating Choices. There appears to be a move from an abstract assertions about work down to a practical drive to be effective. The two extreme Centres seem externally-oriented: at the top (KL7) you accept expressed views about the work situation, at the bottom (KL1) you focus on your choices at work. The other two Centres seem internally oriented: the upper (KL4) requires your inner strength, the lower (KL2) insists on the sort of person that you see yourself to be. In these balanced Centres, whatever is relevant for you has to be simultaneously fully relevant in the work situation generally. the choices-KL1 that you rely on must be in line with work expectations. KL7B ↔ KL4B: Respect for meanings-KL7B challenges whether you are genuinely willing to lead-KL4B; and vice versa. KL4B ↔ KL2B: Your willingness to participate-KL4B energizes the identifications-KL2B that make the work suitable; and vice versa. KL2B ↔ KL1B: The identifications-KL2B relevant to the work confirm the choices-KL1B you activate; and vice versa. Meaning is the intentional substance of all communication. It is also the way that we each construct our world and engage with others. The standard cry when work goes wrong is: "What's the meaning of this?!" In a situation where you voluntarily agree to work for another and often with others, their autonomy in regard to how they see the world must be respected as well as yours. Especially when there are severe disagreements or dissatisfaction, each must respect the other's point of view i.e. the meanings attributed to things and events. Meanings assigned are intensely personal and an expression of autonomy. Work groups function well if people nevertheless share meanings rather than showing consensus by conformity. In a problematic or conflicted situation, you must be aware of the meanings you preferentially assign, while putting aside any superiority for those. Everyone's meanings should be equally privileged. Selflessness is here akin to impartiality and a readiness to apply rational judgement as part of evaluating the meanings surrounding situations. Respect for meaning focuses your picture of the problems-KL6Y, and demands that you require accounts from others-KL6S. Because you are taking the lead-KL4B of your own volition, meanings given to actions and events will commonly challenge you. Assuming no ill-will or foul play, when a work arrangement goes wrong it can only be because one party had inappropriate expectations or did not follow through on expectations. These expectations might relate to matters like the flow of tasks, frequency and style of reporting, the wishes and abilities of other parties, predictions about how events would unfold, or the use of resources like time and money. To design better arrangements, you must participate actively in addressing such issues. Powering your participation occurs primarily to address intense frustration and demoralization i.e. the use of autonomy is geared to loss of well-being. Well-being is part of the common desire of all to enjoy work. The violation of values that are held dear is a particular cause of distress, and unsatisfactory arrangements comes down to values e.g. the value of efficiency, of clean and healthy conditions, of profitability, of bullying, of civility, of penalties &c. Sometimes rules or policies applicable for everyone need amending. Sometimes your contract alone may need to be re-negotiated to be fairer or more appropriate. Participation-PH7L6 is a universal, possible for anyone given values and knowledge relevant in the situation. However, many just float along and free-ride, putting no power into their participation. Being a form of willingness, it requires no training. It occurs through everyday observation, conversation and reflection. Depending on the circumstances, it may involve both becoming a leader and following a leader. Any show of emergent leadership as an aspect of participation is viewed as both desirable and threatening within organizations. Participating commits you to a view of what is bad in the situation-KL6Y, and it gets support from accounts offered freely by others-KL6S. Participating requires you to become realistic through explaining your judgements-KL5Y, and is accepted when you appreciate alternative judgements-KL5S . It must promote needed beliefs and paradigms-KL3. Support for required cultural values and paradigms-KL3S develops your credibility; while insisting on your work principles-KL3Y incentivizes you. Participating powerfully energizes your identifications-KL2B, and may challenge meanings-KL7B given to events by others. Your identifications-KL2 power you forward dynamically and wholeheartedly in any situation. When at work, they become the basis of your inner certainty in discharging any agreement. When you work for another, you may rely on identifications beyond the particular task or role (if it is a post with a range of responsibilities). You may sooner or later identify with the larger project or the organization within which you work. Your skills and expertise are also based in a disciplinary or occupational identification that transcends this particular job or contract. When there are difficulties, your identifications are what you turn to in order to handle the situation. These identifications must energize your willingness to lead-KL4B. They will also reaffirm your principles-KL3Y, and align your support for paradigms-KL3S required in the situation. They must confirm (and be confirmed by) work choices-KL1B. While you clarify and resolving bad arrangements, work must continue and that means a flow of authoritative choices-KL1. The most significant aspects of these are performance-related: deadlines and schedules to complete projects. You must therefore activate choices to demonstrate both that you are responsible and that the arrangements need improvement. You should use choices to provide confirmation that your identifications-KL2B are sound. Choices channel (and are channeled by) beliefs and paradigms-KL3S, and constrain (and are constrained by) your principles-KL3Y. There are two clashing factors here: there is the work itself (usually fairly constant), and then there is the work context (usually dynamic and evolving). These interact and pose issues of representation. Everyone is entitled to autonomy in regard to determining the work-reality. You must impose your view of what is bad because that is the basis for any redesign. However, you must accept that your view is one of many. So long as others are allowed to speak freely, your account is not necessarily privileged. There should be some reciprocity between accounts of others and your personal view. The core mechanism here is «keeping promises»: only a person with autonomy can make a genuine promise, and autonomy is needed to guarantee delivery of the promise. This is a matter of inner strength found as a component (RsH"G24) in the framework producing goodness. See more. Note that this Centre contains the autonomy element (PH-L6) at the autonomy level (KL6) in the Tree. As autonomous and professional, you have the right and obligation to impose your values on to the problematic situation. Your expectations of work have been violated and you must identify the relevant values. If you are clear about what is bad, then you can start designing something better. You can provide a lead if others share your values of what constitutes a healthy work-place. If your values are not shared, you will not make progress and you must re-consider exiting or enduring. Imposing your values and stating what is bad means you know why you are participating and have a clear focus based on accepted meanings-KL7B of events. It ensures you become committed to leading-KL4B and strengthens your explanations of work judgements-KL5Y. You have to talk values and so you need others to give their accounts of the work situation. If there is just one person who has commissioned you, that is simple. If you are in a large organization, you might need to check with several people, perhaps not all in your department or at your level. The variety of accounts soon reveals whether or not there is a consensus on the problem and its inherent values. Accounts should be backed up by data where that is available: but autonomy is based on values not data. Accounts from others must also demand respect for meanings-KL7B, encourage your appreciation of alternative judgements-KL5S, and support your participation-KL4B. Working for another assumes that both parties have the autonomy and capacity to make authoritative judgements based on the understanding that each has. So when things are going wrong, judgements become the focus of criticism and interference. There may be accusations of incompetence, of dissembling, of inexperience, of soundness, or poor standards. Improving matters requires open explanations: on the one hand, your own judgements must be explained, and on the other hand you must seriously consider and appreciate alternative judgements that might have been made (and may even have been suggested or imposed). Your appreciation of alternatives should complement your explanations. You are expected to make judgements within your work role as you understand it, and those judgements depend on your understanding of the situation. To clear the air, you need to explain and justify problematic judgements in those terms. Explanations for your judgements help to ensure participating-KL4 is realistic. They validate your support for required beliefs and values-KL3S, and strengthen your view of what is bad-KL5Y. Looking at the same situation, others often claim that different judgements might have made more sense and should have been reached. As personal perspective, experience and role affect judgement, you should not be surprised. You need to appreciate those alternatives, their logic and implications, in order to attune to the relevant values and sustain the momentum for better arrangements. Appreciating alternative judgements encourages you to require others to give full accounts-KL6S, helps in getting acceptance of your participation-KL4B, and justifies insisting on the value of your own work principles-KL3Y. Value systems include doctrines, theories, cultural values, beliefs, paradigms, teachings, doctrines, philosophies: all ways in which we order the world so as to understand it, get direction and be effective. Each of us sees adherence as an issue of autonomy even if they develop via socialization. Value systems underpin personal identity and group/tribal loyalties. Their divisiveness creates difficulties. Because followers disagree fundamentally, and often violently, acceptability becomes the criterion for peaceful coexistence. In delivering on any contract, your performance is dependent on using paradigms and teachings that you have come to value. There are also the beliefs that determine your personal integrity. The situation, however, will certainly include other doctrines and have a cultural context. You cannot survive within it unless you at least tolerate these values. If matters have broken down, you should actively support beliefs required in the situation to affirm your loyalty and minimize hostility. However, required paradigms and your own beliefs must take each other into consideration. Every work situation takes place within a particular culture, and there is also a local value system expressed as rules, beliefs, conventions and values that are taken for granted. Others will also need to use their disciplinary paradigms and theories. Part of committing to a contract is therefore accepting ways of thinking and valuing that you do not necessarily share or properly understand. In trying to repair a situation, you must actively support the ways things are in regard to current beliefs. Supporting necessary beliefs and ideas in the workplace provides credibility for your participation-KL4B, and validates explanations of your judgements-KL5Y. Required shared paradigms and beliefs should align with your identifications-KL2B, and channel the choices-KL1B you activate. You cannot perform without using your own disciplinary training and professional ethos. Therefore any redesign of arrangements must validate and reinforce principles inherent in these. Insisting on your own paradigms relevant to the contract is a necessity for autonomy, and it ensures your contribution is acceptable in principle. Your principles incentivise you to participate-KL4. Your insistence on your principles justifies appreciation of others' judgements-KL5S. It also reaffirms relevant identifications-KL2, and constrains the nature and timing of choices-KL1. Continue to Repairing Psychic Damage: the Tree of PH-L7s from PH3-Change that helps you demonstrate coping. Initially posted: 20-Sep-2013. Last updated: 24-Jan-2015.